Jim West shares advice on communicating with legislators. The 2010 Leadership Cannon group spent last Tuesday on Capitol Hill in Nashville as part of Cannon County's re-certification into Tennessee's Three-Star Program. Leadership Cannon is essentially an intensive civics course whose participants range from local utility operators to members of the media and educators. Cannon's group is primarily comprised of educators, though the meetings are open to anyone. Director of Schools Barbara Parker leads the program and many of Cannon County's principals and teachers participate. Last Tuesday's visit to Capitol Hill was hosted by State Representative Stratton Bone and afforded participants the opportunity to take a close look at our State's legislative process. "As close as Cannon County is to the Capitol it's great that you can visit easily," Rep. Bone said while welcoming the Leadership Cannon Participants. "This place belongs to you -- to the people of Tennessee." The day began with the group sitting in on a House Agricultural Committee Hearing where the primary topic was legislation concerning dairy farming. Next the group met with Bruce Opie of the Department of Education where they discussed new curriculum, testing standards, and the Race to the Top Program. Teacher evaluation was also talked about. One suggestion was to include standardized test scores in students' final grades to help improve their accountability. After a tour of the Capitol, insights and advice for communicating with legislators were shared by Jay West, who served as Vice Mayor of Nashville under then-Mayor Bredesen before beginning his career as a lobbyist. West's key point was "to mind your manners" — to pretend as if your grandmother were always around. He also said to be as brief and specific as possible. "Telling your legislator 'don't hurt me on these gun bills' doesn't do much good, as there are hundreds of gun bills being considered all the time. You need to know the bill number you're concerned with and what aspects of it you support or oppose," West said. Common sense is also key, West said. "I'll always remember this guy raising Cain about an income tax bill and he's wearing his Rolex watch the whole time... If you're gonna speak against an income tax, leave your Rolex at home." Lastly the group met with Jim Fyke, Bob Richards, and Gerald Parrish of the Tennessee Department of Environment and Conservation. Fyke highlighted the progress made in the last few years within the department, "We had 14 state parks closed in 2003... in 2007 we won Best in Parks... they're all open now and we're very proud to say that." Speaking of the incredible conservation efforts at parks like Fiery Gizzard and Savage Gulf, Parrish said "we were really doing some big things before the money got thin." Bob Richards, Greenways and Trails Co-ordinator, offered advice to Mark Larson and the County's ongoing Greenway project. "You're doing all the proper steps... assessing what you have," Richards said. Grant cycles and applications were discussed, with the current State budget situation constantly looming overhead. "A few years ago we had 10-12 million for parks and greenways, this year we've got 53 applications requesting 4.3 million and we've only got 2.5 to hand out... It's getting competitive," Parrish said. "But if you do it the way it's supposed to be done you stand a great chance." Richards offered to visit the County to help assess and plan for the Greenway. 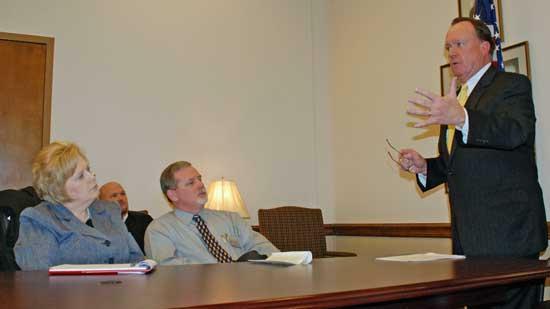 The visit put leaders in Cannon County on a face-to-face basis with their legislators. It helped to explicate important processes and built relationships that should serve the interests of Cannon County and its people. For more information about Leadership Cannon, contact Director of Schools Barbara Parker.